CHICAGO—Against the beautiful backdrop of Croatia’s Dalmatian Coast, on the pristine waters of the fabled Adriatic Sea, co-captains Gary Ropski of Brinks Gilson & Lione and Marcus Thymian of McDonnell Boehnen Hulbert & Berghoff LLP (MBHB) led Team USA to a second-place finish in the 28th annual Patent Cup Regatta, held May 30 through June 2, 2016. McDonnell Boehnen Hulbert & Berghoff LLP provides creative, pragmatic business solutions through a variety of intellectual property services, including litigation, prosecution, and general client counseling. With offices in Illinois, California and North Carolina, MBHB provides comprehensive legal services to obtain and enforce its clients’ intellectual property rights, from navigating patent office procedures to litigating complex infringement actions. MBHB attorneys prosecute patent and trademark applications in both the U.S. and abroad, handle intellectual property litigation matters in trial and appellate courts across the country, and counsel clients nationwide and worldwide on the enforcement and defense of their intellectual property rights. MBHB attorneys are experienced in the procurement, licensing, enforcement, and defense of patents, trademarks, copyrights, trade secrets, and unfair competition actions in a number of technological disciplines and product categories including biotechnology, business methods, chemical, electrical, mechanical and materials, pharmaceuticals and diagnostics, software and telecommunications. Comprised of over 80 attorneys, the law firm provides effective and service-oriented representation on a case-by-case basis. MBHB attorneys undertake each challenge with a full understanding of their client’s business plan and the ways in which the firm’s services help their clients reach their goals. Regardless of MBHB’s role, the firm never loses sight of their clients’ business objectives. MBHB clients know they have trusted their legal issues and plans for the future with knowledgeable, principled professionals who have their best business interests in mind. More information is at www.mbhb.com. 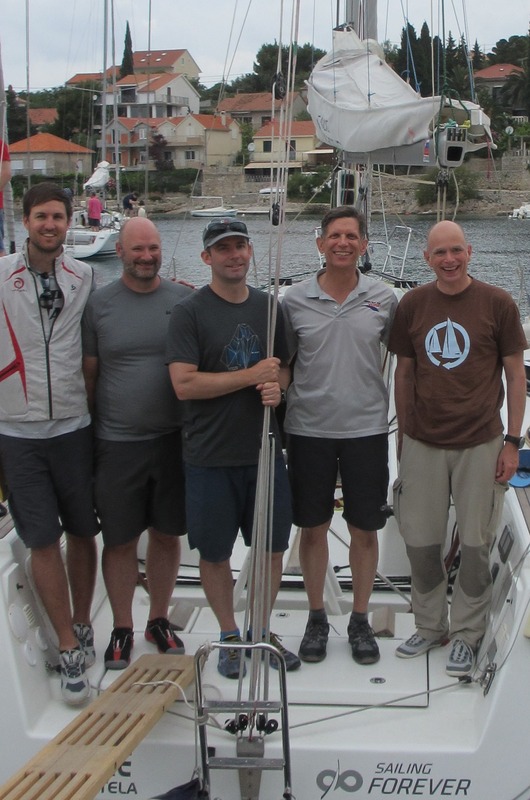 Ian Schillebeeckx, Richard Carden, Marcus Thymian, Gary Ropski, and Patrick Erk aboard Team USA’s First 35 sailboat in Split, Croatia. Team USA members Patrick Erk, Ian Schillebeeckx, Marcus Thymian, Gary Ropski, and Richard Carden display their second-place trophies from the 28th Annual Patent Cup Regatta.